Good morning and welcome back to Generate! I tucked a Supertramp song title in today's edition (hooray clarinet!) Onward . . .
Breakfast in America: Let's spend a little more time with yesterday's revelation that White House economic adviser Gary Cohn will convene a breakfast meeting of high-level energy and climate officials from a number of nations in New York next week. The event to be held ahead of the U.N. General Assembly was first reported by the New York Times and confirmed to Axios by White House officials. The big picture: Experts weren't fully sure what to make of it yesterday. But for veterans of global climate issues who have been dismayed by the White House pledge to abandon the Paris climate deal, it was a ray of hope about the U.S. presence on the world stage. "It's a good sign that the administration is reaching out at senior levels and a good opportunity for other countries to get a clearer sense what kind of path forward the U.S. has in mind," said Elliot Diringer, who was a White House environmental adviser under Bill Clinton and is now executive VP with the Center for Climate and Energy Solutions. "I would say that, as with NAFTA and KORUS [free trade agreements], when it comes to Paris, it ain't over 'til it's over. The administration still seems to be deciding whether or not to stay in and renegotiate or withdraw," adds one longtime player in multilateral climate policy. (KORUS refers to the U.S.-Korea trade deal). Between the lines: Beyond whether the White House might actually seek a path to stay in Paris under revised terms (and there's lots of reasons for skepticism there), the meeting is a chance to discuss what kind of international role the U.S. might play on low-carbon energy issues under President Trump more broadly. One source familiar with the invitation notes that it cites the idea of more efficient use of fossil fuels, which was part of the U.S. message at the G20 meeting over the summer when the White House was isolated from other countries over the Paris deal. "I expect they'll also be testing the response of countries on focusing on those kinds of programs as part of a new U.S. energy and climate strategy," the source told Axios. Climate and coal: The Senate Environment and Public Works Committee will meet later this morning to discuss ways that the federal government can help boost deployment of carbon capture and storage tech, which has been very, very slow to take hold at commercial scale. We previewed the hearing here. Amendment fight: The House could vote as soon as today on more energy- and climate-related amendments to the big, multi-agency spending package before lawmakers. Your Generate host is watching for votes on one GOP amendment that would thwart funds for carrying out EPA methane emissions rules and another that would block use of Obama-era estimates of the so-called social cost of carbon, a metric that helps regulators tally the benefits of avoided emissions. While the votes are largely symbolic, a key question is how many House Republicans might crossover and vote with Democrats. Back in business: A House Energy and Commerce subcommittee hearing on the U.S. power grid, which was supposed to happen yesterday but was scuttled by Hurricane Irma, has been rescheduled for Thursday. It has been split into two parts, with witnesses including officials from the Federal Energy Regulatory Commission and the Energy Department testifying tomorrow, and a second portion happening some time later this month. Big picture: Hurricane Harvey's impact on global oil markets will probably be "relatively short lived." But the storm that snarled Gulf Coast energy networks is a reminder of the outsized role that the region — which is increasingly an export hub for crude in addition to refined products — plays in the global petroleum trade, the International Energy Agency said in its latest monthly oil report on Wednesday morning. "The rise of the Gulf Coast as a major energy hub means that, in some respects, it can be compared to the Strait of Hormuz in that normal operations are too important to fail," IEA said. The multilateral organization said that while the market has coped pretty well with the hurricane season so far, this is a good time to consider new steps to blunt the impact of severe weather in the future. "This could encompass reviewing the robustness of the Gulf Coast energy infrastructure, including production facilities, refineries, crude and product storage capacity, pipelines and marine infrastructure, and what measures can be taken to minimize disruptions to port operations." One big idea: The report says it might be time to dust off an idea that has been batted around for years: creating some kind of U.S.-held strategic reserve of refined products (like gasoline and diesel) to go along with the existing Strategic Petroleum Reserve that holds crude oil. Market details: IEA boosted its projected growth in global crude demand this year to 1.6 million barrels per day over last year, while OPEC's crude output fell in August for the first time in five months. Surplus oil supplies are declining, and overall IEA said there are signs that the market has "started to rebalance." Go deeper: CNBC delves into the nitty-gritty numbers of the report here. Short supply: The Los Angeles Times looks at the scramble for gasoline facing Florida residents as people who fled Hurricane Irma try and get back home but have a hard time fueling up. "With ships unable to make deliveries through the storm and power outages forcing stations to close, up to 40% of the gas stations in the state were unable to provide fuel Tuesday, the online source GasBuddy reported," the paper reports from Florida. Power coming back: Florida's Division of Emergency Management reported Wednesday morning that the share of customer accounts without power has fallen to 38% as restorations continue. As of early this morning, they're reporting 3.9 million accounts without power. But one account can represent multiple people, as The Washington Post notes in this in-depth look at power outages that may last weeks in some areas. Ripped from the headlines: The Environmental Defense Fund, a major green group, launched a new TV ad Tuesday that uses the impact of Hurricane Harvey to warn lawmakers that they will be "held responsible" if they cut funding to the Environmental Protection Agency. The $50,000, three-week buy of 30-second ads on several cable networks running in D.C. warn of more pollution and public health problems, and then cuts to images of the fires at the Arkema chemical plant near Houston. Why you'll hear about this again: The ad buy signals that the recent hurricanes and broader environmental threats from extreme weather will provide environmentalists new political openings to attack White House and GOP efforts to cut EPA funding and pare back regulations. The ad comes in addition to a wider, $1 million media and organizing campaign in a number of states to defend EPA's budget by EDF Action Fund, the political advocacy partner of EDF. 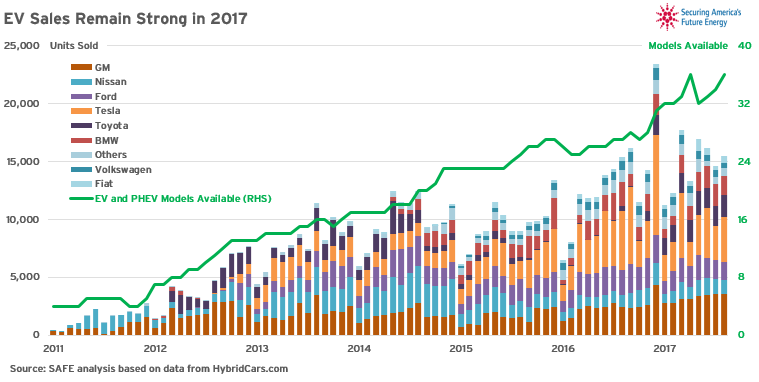 U.S. market snapshot: The team over at Securing America's Future Energy has a look at the U.S. market for plug-in hybrids and full electrics (including this cool chart). "Sales increased in August by more than 10 percent annually to 16,503 units. As of now, there have been 677,000 EVs sold since the beginning of 2011, thanks in part to automakers regularly rolling out new models. There are now 37 commercially-available advanced fuel vehicle (AFV) models in the U.S. market, including 23 plug-in electric hybrids (PHEVs), 13 EVs, and one fuel cell vehicle, giving consumers a variety of affordable options." Latest offerings: The Associated Press reports that EVs are taking center stage at the Frankfurt auto show. NTSB findings: My Axios colleague Kim Hart reports that the National Transportation Safety Board concluded that Tesla allowed a driver to use automated controls outside of conditions for which they were intended, leading to a car crash that "never should have happened." The board had investigated a 2016 crash involving a Tesla partially-automated vehicle. The driver of the vehicle was determined to have also been overly reliant on automated features. Irma follow-up: File under "No good deed goes unpunished." Over at the Marginal Revolution blog, economist Alex Tabarrok wonders whether Tesla might face blowback after temporarily unlocking extra range on 60kwh versions of the Model S and Model X to help Florida owners flee Hurricane Irma, remotely giving them the 75kwh power of the pricier versions. "Unfortunately, I fear that Tesla may have made a marketing faux-pas. When it turns off the extra mileage boost are Tesla customers going to say 'thanks for temporarily making my car better!' Or are they going to complain, 'why are you making MY car worse than it has to be?'" The Energy Department's top renewable energy official on Tuesday praised a massive solar farm in California for "improving" after he criticized it while testifying to Congress last year as a conservative expert. Daniel Simmons, the acting head of the department's renewable and energy efficiency office, toured the facility, named Ivanpah, on Sunday before giving remarks to a solar industry conference underway this week in Las Vegas. Why it matters: Simmons' comments show the subtle ways some conservative experts known for blasting then-President Obama's policies are moderating their rhetoric as they join the federal bureaucracy that created those policies. Click here for the rest of the story in the Axios stream.